Seven meters below ground, archaeological remnants of the temple are coupled with immersive walls of light, creating a three-dimensional superstructure. 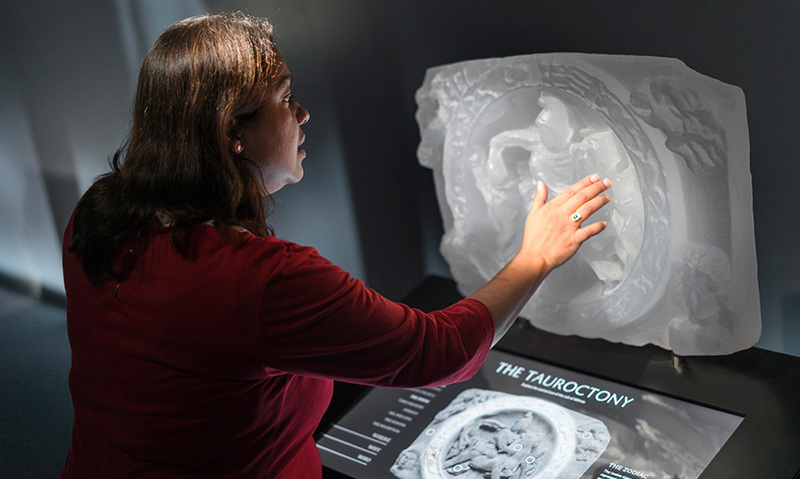 Temple artifacts are rendered in translucent resin and set atop interactive displays that offer a deeper dive into content and scholarship. 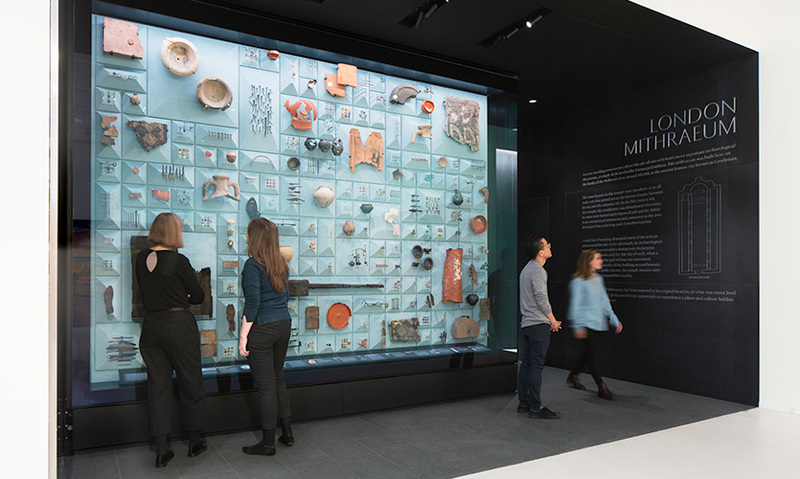 The space includes a vitrine displaying over 600 Roman artifacts discovered during the excavations in advance of construction of Bloomberg’s new European headquarters. Interactive stations are set against a backdrop of dramatic animations with evocative audio narration that tells the story of the Mithras cult. Visitors flow from the staircase into the mezzanine-level exhibit, which contains the bulk of the scholarly materials. Projected figures emerge magically from the shadows into light. Visitors descend via a cascading staircase with flanking granite walls that have an etched, graphic presentation showing a graphic depiction of archaeological layers. Walls of structural light rise over the temple foundation remnants; the light is projected to mirrors and refining apertures to increase the density and intensity of the beam. 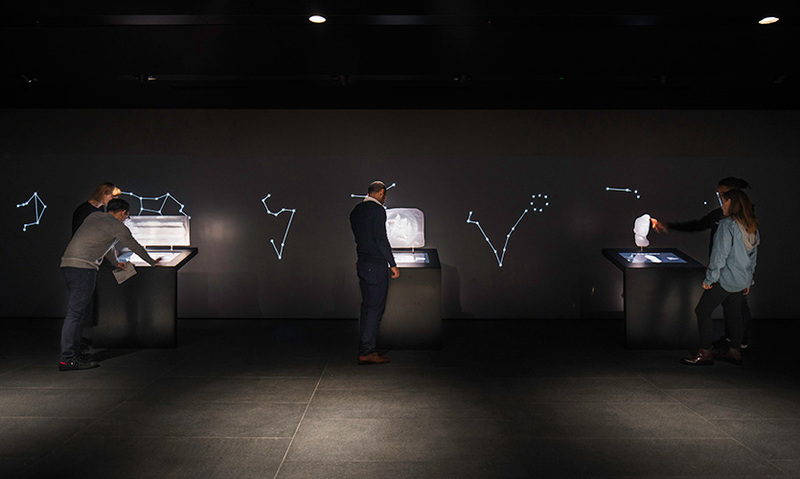 In an exhibit designed by Local Projects, the space includes a gallery of contemporary art and a vitrine displaying over 600 Roman artifacts discovered during the excavations in advance of construction of Bloomberg’s new European headquarters. The artifacts are mounted on a topography of pyramidal forms, a reference to classical architectural façade motifs. The collection comprises a number of hugely significant archaeological discoveries, including the first ever written reference to London and the earliest dated document ever found in Britain. 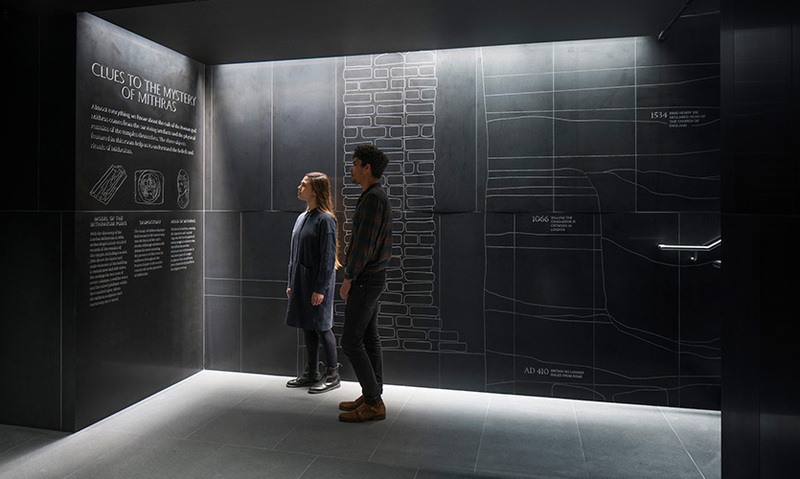 Visitors descend via a cascading staircase with flanking granite walls that have an etched, graphic presentation showing stratigraphy, a graphic depiction of archaeological layers going from modern to ancient Roman. They then flow from the staircase into the mezzanine-level exhibit, which contains the bulk of the scholarly materials paired with 3D recreations of temple artifacts: the head of the god Mithras, the tauroctony relief and the temple model. These are each rendered in translucent resin, set atop the interactive displays that offer a deeper dive into content and scholarship. 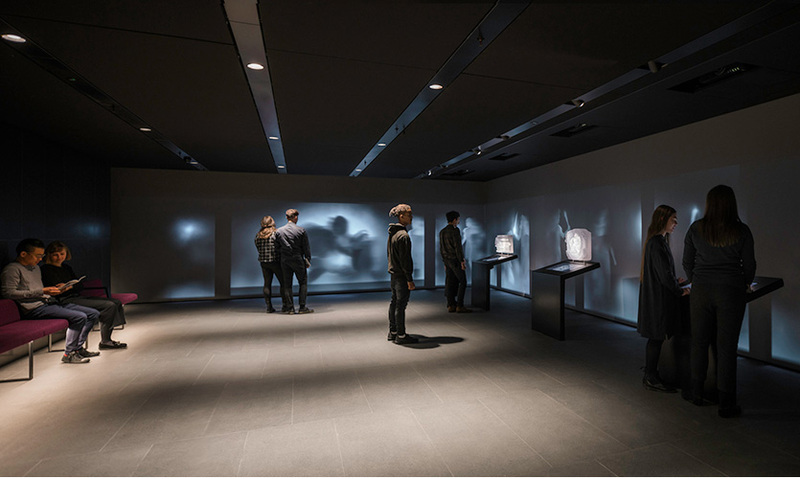 These interactive stations are set against a backdrop of dramatic animations with evocative audio narration by contemporary scholars that tells the story of the Mithras cult. Projected figures emerge magically from the shadows into light. Finally, visitors make their way to the bottom level and enter a large darkened room. Walls of structural light rise over the foundation remnants of the temple. Theatrical fog (never before used in a permanent installation) gives light beams their physicality. The light is projected to a series of mirrors and refining apertures to increase the density and intensity of the beam. The temple altar consists of five layers of water-jet-cut steel, cantilevered so that each silhouette is illuminated. The temple reconstruction itself was conceived and assembled by leading experts from across a range of fields. The research, design and mock-ups for the reconstruction took nearly eight years and the actual reconstruction another 18 months. Measuring 18 meters long, eight meters wide and over two meters in height, the reconstruction replicates the ruined remains of the temple found in 1954. 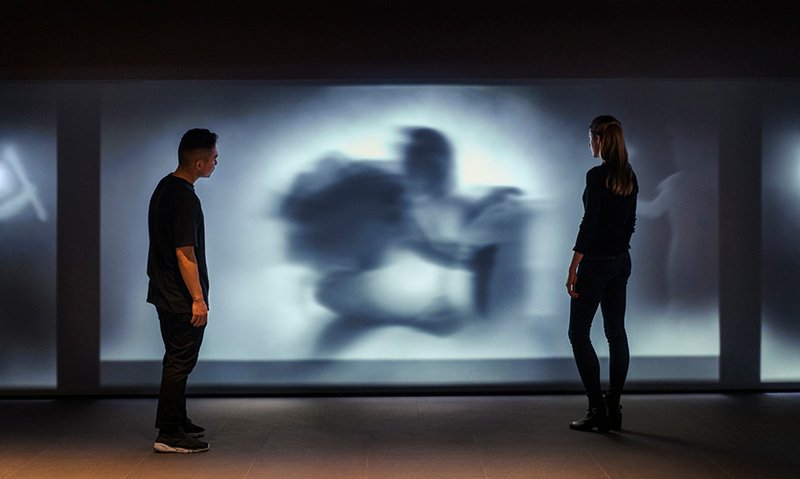 By coupling contemporary art commissions and immersive installations in dialogue with archaeology, the London Mithraeum Bloomberg SPACE asks all visitors to meditate on the past and its meaning for today. 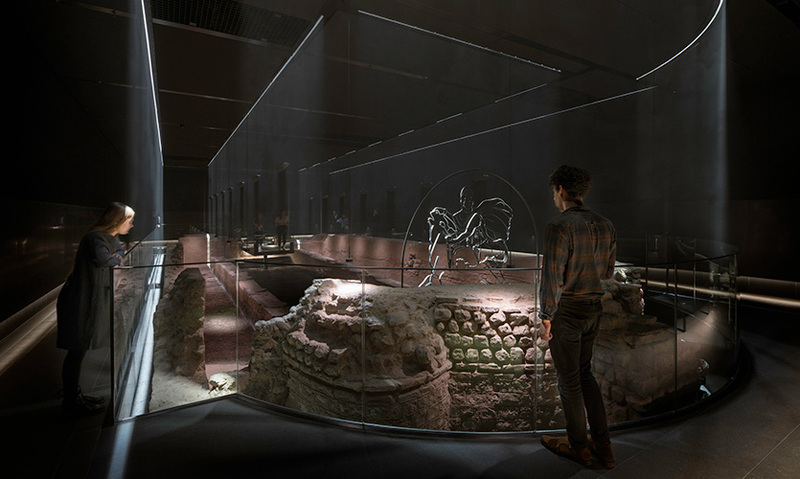 The unique reconstruction makes a major contribution to the City of London, providing a major new historic site for visitors to enjoy and creating new partnerships. Since opening in late November 2017, the relatively small space has had over 40,000 bookings and has enjoyed extremely positive feedback and reviews. "Wow! It's really exciting to see traditional museum exhibit design elevated to the next level. It's the total package." "This perfectly contextualizes and makes tangible the challenging content of myth. 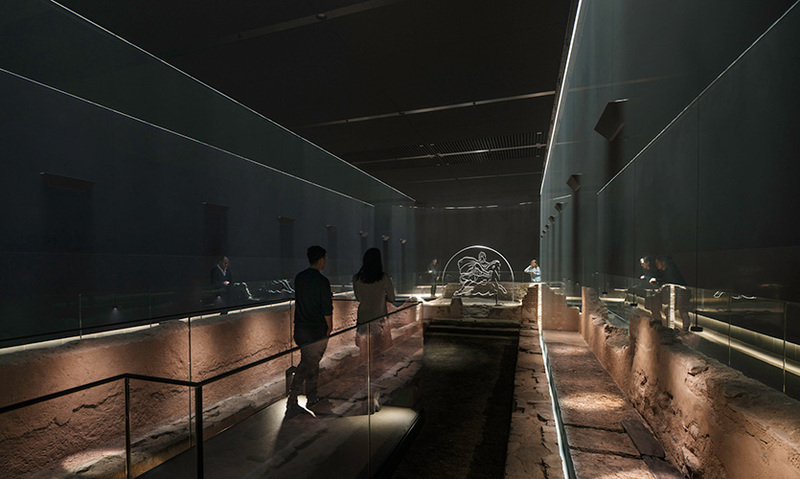 The exhibition connects visitors to an archaeological site, then layers mood and scale to tell a captivating story of culture and ritual." "The selected materials have weight and presence that are just right for this space. The design complements the exhibit flawlessly."